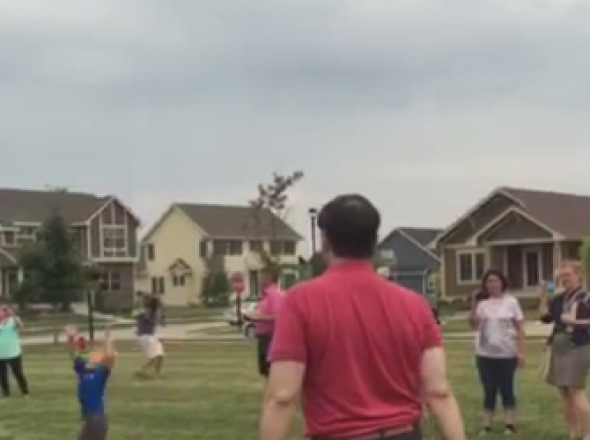 Marco Rubio, kid, football: Iowa photo-op goes humorously awry. Tossing the ol’ pigskin is a campaign-trail trope right up there with kissing babies, although I think that’s because campaigns traditionally have taken place during the fall leading up to Election Day, not during the fall before the fall leading up to Election Day. Anyway, it’s almost (2015) football season and Marco Rubio is in Iowa campaigning and Bloomberg Politics recorded him knocking a little dude over with a football. Not a terrible throw. The kid probably could have hauled it in. It’s really a pretty good metaphor for how demographic trends have helped the South surpass the Midwest as the United States’ locus of football talent. Most Iowa-Florida football interactions would probably end this way.